We typically think of gum disease as a malady reserved for older adults. However, children are at a risk for gum disease, too. 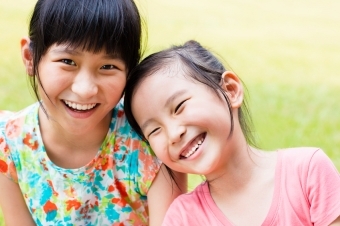 For kids, as with adults, prevention is they key to healthy gums. The fact is, teenagers and even younger children are also at a risk for gum disease or gingivitis, which may require treatment. However, prevention is a much better option when it comes to gum disease; better to head it off and not get it at all! Gum disease is caused by a buildup of plaque, a sticky film that can build up on teeth as a result of bacteria not being regularly or sufficiently washed away. As more plaque builds up, it hardens to form tartar, which infects the gums and causes them to become red and swollen. If the disease isn’t caught early on, it can even cause the teeth to loosen and in extreme cases fall out, because it degrades the soft tissue and bone that support the teeth. It’s not terribly common for children to get this serious form of gum disease, but gingivitis, its less extreme form, is actually quite common in children and even more so in teens. How Can Gum Disease Be Prevented in Children? Gum Disease is easy to prevent in children, and there's no secret to it; simple good oral hygiene at home and regular visits to the dentist for cleanings and checkups are all there is to it! Gum disease is prevented in the same way tooth decay is, and indeed, these two oral health issues usually go hand-in-hand. If you need more advice on how to prevent gum disease in your children, please contact our Langley dentist's office. We'd be glad to help!